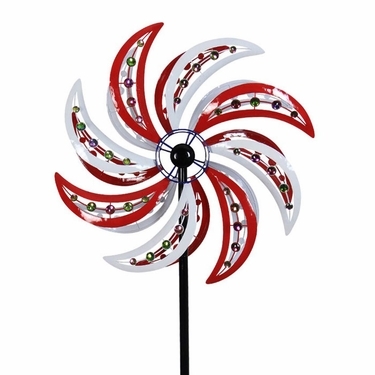 Your garden already looks beautiful, but wouldn't it look even more stunning and festive with our brand new 75" Giant Patriotic Beaded Wind Spinner? We think so too! All metal in design, constructed with stainless-steel ball bearings so it will twist gloriously in the wind, and the bright beads will add that extra artistic touch you have been looking for. Painted in vibrant metallic paints of red and white, your new spinner will shine brightly in the sun. It has a firm 4-prong pitch stake bottom for extra stability so you know there are endless hours of joyful spinning ahead! Size: 24" x 11" x 74"H, Metal & Plastic Beads.